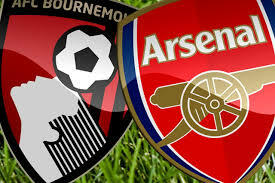 AFC Bournemouth faces Arsenal in a match from the 13th round of the English Premier League. We will take a look at this clash, which will be played at Sunday afternoon. Bournemouth are doing very well since the beginning of the season. Eddie Howe’s team is currently 6th in the standings with 20 points, being on 4 points behind the 5th Arsenal – their next opponent. Right now Bournemouth have a record of 6 wins, 2 draws and 4 defeats. They were in a good run of results, but lately suffered two consecutive defeats against Manchester United and Newcastle. Bournemouth visited the St. James’ Park in their last fixture, but suffered 1-2 defeat against Newcastle. Salomon Rondon scored a brace for the Magpies, while Jefferson Lerma scored Bournemouth’s only goal in the game. But it was not enough for at least a point in the clash. Many people thought that Bournemouth could find against relegation this season, but so far they are performing like a contender for European qualification. If Eddie Howe’s team keeps this level of performance in future, they could enjoy a really good season. Arsenal were enjoying a run of 7 consecutive wins in the league, but in their last three games the Gunners made three draws. This is the reason why Unai Emery’s team is already trailing on 8 points behind the leader Manchester City. In their last three games Arsenal made draws against Crystal Palace, Liverpool and Wolverhampton. This is quite dissapointing for the club and its fans. In their last game Arsenal made a 1-1 draw against Wolverhampton at home. Ivan Cavaleiro opened the score for Wolves. The visiting team was very close to win this, but Henrikh Mikhitaryan equalized for Arsenal just 4 minutes before the end. These are our thoughts about the Premier League clash between Bournemouth and Arsenal.